Youth travel accounts for between 20 and 25 percent of all international tourist trips, based on the World Tourism Organization’s (WTO) estimates. The market is growing due to an increased participation levels in tertiary education, labor mobility and global study programs. 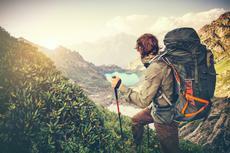 As a result, backpacking has emerged as an element of global youth culture. According to data collected by Essential Travel, 48 percent of those leaving college, either temporarily or permanently, said their economic situation played a role in the decision to go backpacking. College students and recent college graduates chose this kind of adventure to improve their cover letters, learn a new language, gain work experience, and volunteer. If you’re the type of person who likes nothing more than exploring all that nature has to offer, then there is no better way to travel than backpacking. Sleeping under the stars at night, enjoying the stunning beauty of nature by day, and traveling through wilderness is among the best ways to relax and rejuvenate. Exploring new land with your own two feet, making your own way and carrying everything you need on your back, brings an unrivaled sense of pride. It can also bring a lot of pain if you are not well-prepared. Meeting new people, exploring new places, trying new foods, and embarking on adventures most people just dream about sounds like a dream fantasy. But it’s quite realistic if you know a few important facts.